Property 7: Quiet house and comfort in the countryside, private pool. House, quiet and comfort, private pool, air conditioning. Property 8: House, quiet and comfort, private pool, air conditioning. Property 9: A vacation in a paradise. . . an exceptional site. Property 16: Medieval charm and soaring vistas in the heart of Provence: what's not to love? 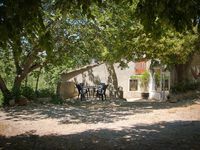 Property 25: Stone house "chives"
Property 27: Cottage with pool in a quiet hamlet in the heart of orchards: authentic stay! We loved our stay here in Mollans-sur-Ouveze. The owner, Lois, went out of his way to make suggestions for places to visit nearby and was extremely helpful whenever we had questions. 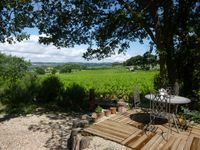 The property was very close to Vaison la Romaine and the Cotes du Rhone wine route with its wonderful little villages. The cottage was clean and had everything we needed. Internet reception was best outside due to the thick walls of the cottage. It was lovely to sit outside and have our meals under the fig tree. Lois and his young family have done an amazing job of restoring the property in the short time they've lived here. Thank you for making us feel so welcome.